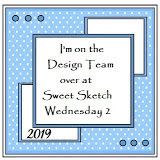 Here is my card for this weeks challenge over at Sweet Sketch Wednesday 2. This week we are using Dearie Dolls images and I am still in scarecrow mode so chose this one which was precoloured. Papers and embellishments came from the Take it Easy kit from Craftwork Cards and the Maya Road ribbon came from there many years ago too. I don't have any large ovals so I used a label die for the mage and drew around it for the mat. 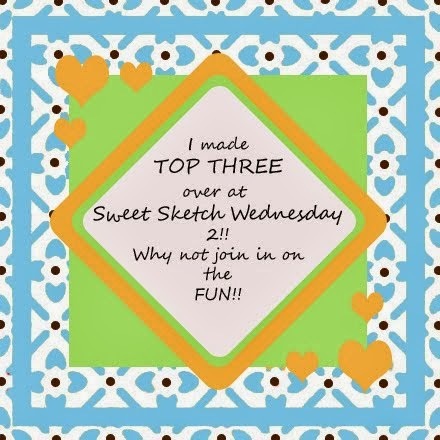 Another great one, do pop over to the Sweet Sketch Wednesday 2 blog and play along with us. Oh Anne this is a super cute Scarecrow image. 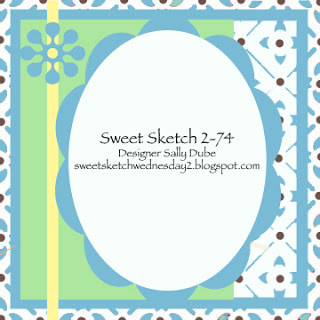 Such pretty colours and I love your design papers and embellishments. They all work perfectly together. Take care and have a great week. Sigh, sadly in my world, Thanksgiving and Autumn don't get the respect they deserve. I am usually in such a panic to finish my Christmas and Winter cards. This is so darn cute Anne. I love the colors and that darling image. Great card this week. Great image, even more so as it is pre-coloured and those papers go just great with it, yes I know, that's why you chose them. Think it is your turn for the goodies next week, don't go overboard, I was well stuffed with Becky's last month. Lovely cute card. Thank you for your comments on my blog. How sweet Anne!! Love your image (I missed this one!) and the papers you used are fantastic!! Simply perfect.